For years, I thought it would make me safe. I strapped it on for size, pulling the ropes taut—trying to secure that which felt out of reach. I fretted, plotted, and paced trying to tame what might come…the unexpected, the unknown, the unraveling ahead. Through sweat, tears, and orders barked, I tried to grasp shiny security, but the further I reached, the more frustrated I became. It wasn’t really what I wanted. I desired peace within. Yet I thought I wanted to be in the know more. I longed for insight into what would transpire. Yet really, I wanted to know that I wasn’t alone, no matter what happened. Loneliness accompanies the one holding the reins—especially when you have a death grip on them. What I really wanted was assurance that He was enough for me, and enough for whatever might come. What I was missing was the revelation of grace. Jesus Himself is the One who is truly in control, so I don’t have to be. Thank You God for not giving me what I really wanted, by providing me with what I actually needed. I find grace in the unraveling as You unwind my soul and assure me of Your love. 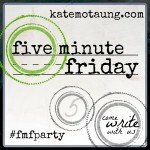 It’s been awhile since I joined the writing crew over at Kate Motaung’s Five Minute Friday. Join us, whether on a blog, social media, or in a notebook, as we write for 5 minutes flat on this week’s prompt: CONTROL. 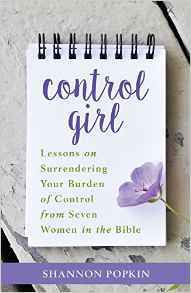 My friend Shannon Popkin is guest posting over at Kate’s place about her new book, Control Girl. Be sure to check it out! Glad to be neighbors at FMF, Bonnie. So thankful that God is in control and holding us close. Amen! God is in control but it can so hard to trust in that. So nice to see you here friend. I’m over in the 11 spot this week. Hi Friend! May He helps us rest in His Sufficiency and affection. Have a great weekend! What a beautifully written commentary. I struggle with letting God be in control. Katie, that’s brilliant. Something I never realized, and I was lonely for so long! Control can make us feel safe for a time, but soon we realize it’s more of a cage that a shied. Thankful that in Christ we are free as He surrounds us as a shield with His care. 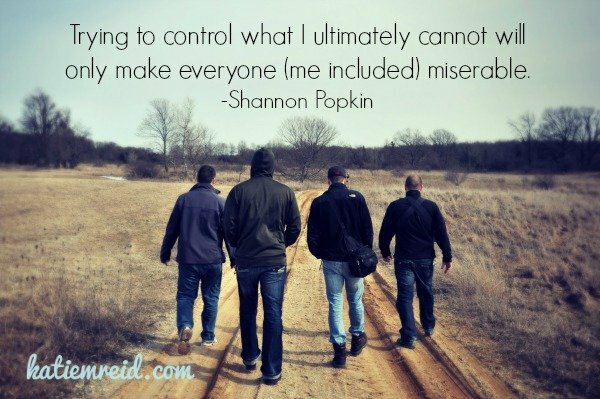 You are SO right – control only brings loneliness. I can sure relate to that. Hi Sarah- So thankful that we are not alone, in Christ. Happy Friday to you! Hey, Katie! Nicely done. Yes, you and I have similar struggles, don’t we? Glad we also share the same Lord–the Prince of Peace. So fun to see you on FMF this week! “What I really wanted was assurance that He was enough for me, and enough for whatever might come.” I totally resonate with this and only recently realized that was feeding my need for control (wrote about it this week). Ultimately, He holds the reigns so I have no reason to fear. But it takes practice to embrace that reality. I’m #58 at FMF linkup. Hi Stephanie- Yes, so glad He holds the reins! Great post, Katie. This is my first time linking up at FMF, and it’s fun to read everyone else’s takes on the prompt!